Also with four peice M5 stainless steel screws and 40 peice printed stickers. per circuit. Input Wire Size: #4-6 AWG. Output Wire Size: #12-16 AWG. Fits for middle size blade fuse (ATC, ATO). This 8-way fuse box in sturdy construction can be used in automotive electronic field, motorsport applications, electrical devices, trailers, cars, boats, etc. Wire: Multi-Stranded OFC Copper. 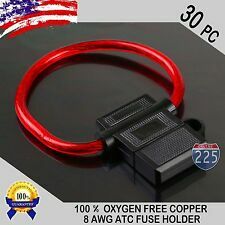 Multi-Stranded 100% Oxygen Free Copper ATO/ATC Blade In-Line Fuse Holder. Type: ATO-ATC Blade In-Line Fuse Holder. 30 Waterproof In-line Fuse Holders. Fuse Type: ATO/ATC Blade. 2A/3A/5A/7.5A/10A/15A/20A/25A/30A/35A, 10 kinds of standard blade fuse. 6 35A Standard Fuse. These are ideal kind of Zinc Alloy standard blade fuse, lightweight and durable. Single fuse size: approx. Wire: Multi-Stranded OFC Copper. Multi-Stranded 100% Oxygen Free Copper ATO/ATC Blade In-Line Fuse Holder. Type: ATO-ATC Blade In-Line Fuse Holder. 100 Waterproof In-line Fuse Holders. Fuse Type: ATO/ATC Blade. Fuse protection cover - A neat clip-on plastic cover that adds extra protection to your fuse box & fuses. 1 Piece 8 Way Blade Fuse Box Holder. - LED Indicator for blown fuse-The LED indicator lights up when a blown fuse is detected. Wire: Multi-Stranded OFC Copper. Multi-Stranded 100% Oxygen Free Copper ATO/ATC Blade In-Line Fuse Holder. Type: ATO-ATC Blade In-Line Fuse Holder. 50 Waterproof In-line Fuse Holders. Fuse Type: ATO/ATC Blade. Wire: Multi-Stranded OFC Copper. Maximum Current: 40A. Multi-Stranded 100% Oxygen Free Copper ATO/ATC Blade In-Line Fuse Holder. Type: ATO-ATC Blade In-Line Fuse Holder. 100 Waterproof In-line Fuse Holders 100 Fuses. Automotive fuse box, suitable for middle-sized blade fuses. For fuse: 8 middle-sized blade fuses. 1 x 8 Way Blade Fuse Box Holder. Compact size, sturdy construction. maximum load 15A per way. Material: plastic & copper. Fuse protection cover - A neat clip-on plastic cover that adds extra protection to your fuse box & fuses. 1 Piece 8 Way Blade Fuse Box Holder. 1 Piece 6 Way Blade Fuse Box Holder. - LED Indicator for blown fuse-The LED indicator lights up when a blown fuse is detected. Jewelry Findings. 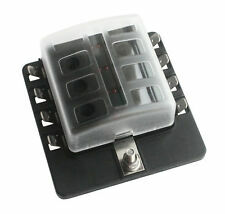 - Fuse protection cover - A neat clip-on plastic cover that adds extra protection to your fuse box & fuses. 1 Piece 12 Way Blade Fuse Box Holder. 1 Piece 10 Way Blade Fuse Box Holder. Wire: Multi-Stranded OFC Copper. Maximum Current: 40A. Multi-Stranded 100% Oxygen Free Copper ATO/ATC Blade In-Line Fuse Holder. Type: ATO-ATC Blade In-Line Fuse Holder. 30 Waterproof In-line Fuse Holders 30 Fuses. Fuse protection cover - A neat clip-on plastic cover that adds extra protection to your fuse box & fuses. - LED Indicator for blown fuse-The LED indicator lights up when a blown fuse is detected. 1 Piece 6 Way Blade Fuse Box Holder. Fuse protection cover - A neat clip-on plastic cover that adds extra protection to your fuse box & fuses. Jewelry Findings. - LED Indicator for blown fuse-The LED indicator lights up when a blown fuse is detected. ATC Automotive Blade 8Way fuse box. - DC 12V and DC 24V system compatibility, up to DC 32V. - Automotive fuse box, suitable for middle-sized blade fuses. 1 x Standard Blade Fuse Box (The blade fuses in the picture are not included ). Product install range: It can be installed in cars, houses, cars, buses, yachts, boats, etc. If item is defective after 3 months, you can still send it back to us. We will send you a new one after receiving the defective item. 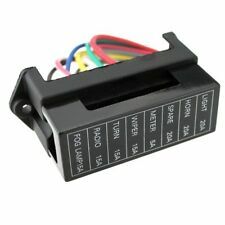 High quality 4 way fuse box Clear, vibration resistant, snap fit cover Can be secured via 2 pre molded holes Cable connection via side, plated 6.3mm (standard) blade terminals Sturdy and robust construction Type 8 way Fuses 10A x 2, 15A x 2, 20Ax 2, 30Ax 2 Terminal 6.3mm (standard) Dimension 155mm(L) x 53mm(W) x 42mm(H) Fuse Type Not Applicable Country/Region of Manufacture Hong Kong Brand Unbranded/Generic MPN UE735548158097 UPC 735548158097 Brand Unbranded/Generic MPN UE735548158097. Accepting fuse: Standard blade fuse (ATO / ATC). Each fuse holder is numbered to make fuse installation and identification as easy as possible. Our product is fuse box, the fuse in picture is NOT included in our item. Suitable fuses: fits for 1A, 2A, 3A, 4A, 5A, 7.5A, 10A, 15A, 20A, 25A, 30A ATC/ATO blade Fuse of 19.1 x 18.5 x 5.1 mm. 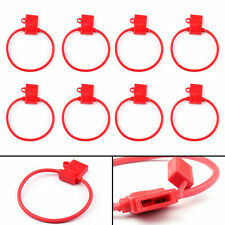 Safety protection: Heavy duty 12 gauge (AWG) Red Color wire, great look and added protection to the circuit. Automotive fuse box, suitable for middle-sized blade fuses. For fuse: 8 middle-sized blade fuses. 1 x 8 Way Blade Fuse Box Holder. Compact size, sturdy construction. maximum load 15A per way. Temperature range: -20 to 150℃. Standard ATO / ATC / APR fuse types. - Blade Fuse Box with Fuse and mounting Accessories,can be installed in circuit. 1 Piece Fuse Box Holder. - Transparent plastic cover with push latch system, easy to operate, splash and dust-proof design. 1 - ATC 7 1/2. 1 - ATC 10. 1 - ATC 15. 1 - ATC 20. 1 - ATC 25.